If you’re truthful, you can have credibility. If you are credible you may not always be truthful. Part of what I do in my field of deception is determine credibility through a systematic, proven system. I don’t interpret. I take what the writer or speakers says verbatim and analyze it. 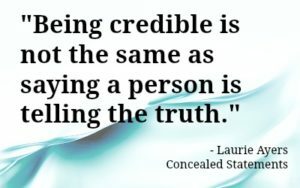 Being credible is not the same as saying a person is telling the truth. It is, sometimes, just not always. Credible means: able to be believed; convincing. Truthful means: telling or expressing the truth; honest. Lying means: intending to deliberately mislead another. There are exceptions to the definition of lying such as actors, poker players, some sales personal, in that we already know they are likely to be lying. That’s not what I’m referring to, rather misleading without prior permission or notice. The words deceit and lies are often correctly used interchangeably. Credible and truthful are also often used interchangeably, but as you can see from the definition – they should not be used synonymously. I have conducted content statement analyses on different people. Some I have deemed as credible. Yet some readers who have reviewed my analyses believe I am grossly mistaken as some of the people I reviewed they believe to be big liars. See above. Credible is able to be believed and convincing (based on scientific analysis, not gut). I did not say these people were telling the truth. I did not suggest they were being honest. I said that they were credible. Credibility comes from 1. Telling the truth. 2. Personally believing what is being said or written, therefore there would be no intent to deceive, as they believe they are telling the truth and 3. Being a really good liar, which could indicate other personality issues which I will not get into here. I can only shake my head at the countless, prejudged opinions of others who insist someone is lying. Perhaps they are. But without ground truth, without having hard evidence in hand, it’d be irresponsible of me or anyone else to state factually that someone is lying. As a deception expert, I rarely suggest to a client that someone is lying because I don’t have ground truth. What I can tell them is that at a certain point in their statement, there were indicators that they may be lying and that the client may want to probe further. Outside of a court of law, an example of ground truth may be that you have on your phone a text that was clearly meant for someone else. You may question the sender about the content, only to be faced with denials such as “It didn’t happen.” “I wasn’t there.” “I did have to work late.” Yet in this case you have the text to prove otherwise. That would be ground truth. I have personal experience with this. I had to testify about a personal matter. I testified truthful. I have the ground truth and I know better than anyone that it happened the way I said it did. The judge came back that I was not credible. What?! Clearly he was mistaken. Also, there could have been a number of factors that led him to this conclusion. I suspect that either nerves got the best of me due to the nature of the testimony; or the person deeming credibility was, frankly, wrong. This is a perfect example that someone can be truthful and not appear credible. Conversely, they can be credible and not be telling the truth. Yet another time during my deception training, among our group of delegates we had to tell a personal story to each other. Ahead of time we were assigned secretly who would tell a truthful story and which of us would lie. Then to test our skills, after the story we had to come up with a judgment. My story was truthful about a time I was on a treadmill at a hotel with a group of flight attendants. It’s a rather entertaining story, ask me about it. Anyway, again it was 100% truthful. Nonetheless all of my peers deemed that I was lying. This was early on in our training so at this point they were just operating off gut, and not a proven system. They incorrectly decided it was so wild and that I didn’t recall some of the details so it must not be true. The next time you hear that someone is credible know that credibility means what they are stating is believable. It does not mean that it is necessarily truthful, though as mentioned above, often they do go hand in hand. What Makes a Lie a Lie?